Optimum steering, braking, handling and tire wear depend on accurate suspension alignment. In its most basic form, a wheel alignment consists of adjusting the angles of the wheels so that they are perpendicular to the ground and parallel to each other. The purpose of these adjustments is to maximize the tire life and have a vehicle that tracks straight and true when driving along a straight and level road. When your tires are not aligned properly, your vehicle will start pulling to one side. This can make it difficult to handle, especially in wet or icy conditions, possibly causing an accident. When to Perform an Alignment? Driving over potholes, bumping into curbs or hitting other objects can knock your wheels out of alignment. Sunnyside Acura recommends performing an alignment on your vehicle once a year or every 12,000 miles, whichever occurs first. It is also a good idea to perform an alignment whenever you purchase a new set of tires. Why a Sunnyside Acura Alignment Service? Alignments are critical for vehicle handling and maximum tire-tread life. At Sunnyside Acura we have the latest technology and factory trained master technicians that know your vehicle and how to make accurate adjustments. 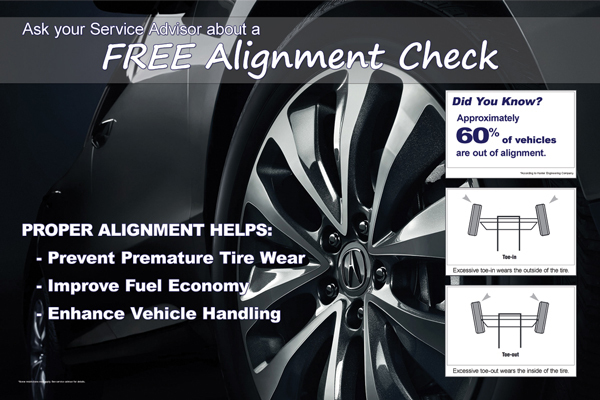 *Free alignment check for most passenger vehicles, some restrictions may apply. Ask service advisor for details.